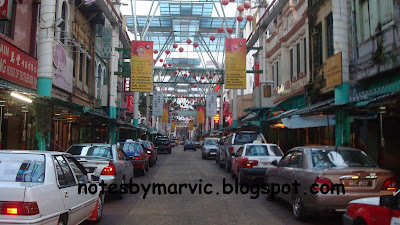 I like walking in Petaling Street on Saturday morning, as early at 6.30 to 7.30 am. I like to smell hot black coffee and having dim sums as breakfast. Read newspaper like any other Ah So and Apek around me...Like to smell fresh flowers at the flower stalls. Petaling Street is a Chinatown in Kuala Lumpur and infamous with pirated cloths and accessories along with bootleg with DVDs and CDs. The traders mainly are Chinese but however there are still Indians, Malay and foreigner who do trading at Petaling Street. Haggling is the common sight in here and the place is always crowded with locals and as well as tourists.This heritage site were largely Cantonese and Hakkas who came in for tin trade in mid 19th century. Their famouse Chinese Kapitan is Yap Ah Loy, Hakkas.